How was your Thanksgiving? I hope it was filled with family, friends and food! Our little clan traveled all the way back to the Southeast to spend the holiday with Damon's mother and family. We touched down in New Orleans at nearly midnight on Sunday. After a good night's sleep, we spent the morning walking the French Quarter then we grabbed some lunch. Marlie sampled gumbo, red beans & rice, and jambalaya. She though the beans were too spicy, but she gobbled up everything else. Then we enjoyed the sounds of a brass band on the square and ate some beignets before embarking on the 2.5 hour drive to Daphne, Alabama. It is always stressful to spend time with family around the holidays, but it also wonderfully refreshing. It recharges my spirit to be around people who have known me all or most of my life. It was sweet to see Marlie bond with her second cousin and it was sweet to see Damon's mom with her grandchildren (this was her first time meeting Desmond). So no matter how much money it costs or time is spent traveling, it is always worth it to go see family! Marlie and her cousin were inseparable! They had a few little spats, but mostly they enjoyed playing together, just like sisters. Marlie even slept over a couple of nights and we noted that this was the first time she had spent the night away from us. She takes giant developmental leaps after she's spent extended time with older kid relatives. Little man was the star of the trip! 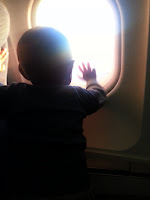 He slept like a baby on both plane rides and smiled broadly at the passengers around us when he was awake. He enjoyed being the center of attention of course. Glad it was a fun trip! I've been all around New Orleans, but never made it to the city. My hubby loved it when he was there. One of these days... What are beignets? Isn't it great when your child finds a playmate/buddy in family? It's a beautiful thing...glad that you all had fun and that you all got a chance to relax and have a great vacation! Glad to hear you had a wonderful Thanksgiving! It really is true how the little ones make strides after being around bigger kids. Oh and hooray for Desmond doing well on the plane! Girl, I can't imagine traveling with two little ones! Oy! They are growing so beautifully, btw. I love these logs! I've always wanted to visit New Orleans and definitely hope to take Aiden there one day.